Flexible One-Way Straws Supplied In A Pack Of 15. When talking about straws and drinking aids, these flexible one way straws shouldn't be far from anyone's lips. 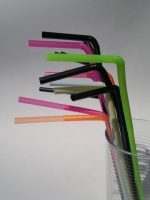 Supplied in a pack of 15 bendable one way straws, these items have a simple one way valve that stops liquid from slipping back into the cup or mug between sips. The fluid is actually kept in the straw making it ideal for those who find it difficult to maintain suction with a traditional straw.